The Essential Jersey Boys are guaranteed to get your audience partying all night with their tight vocals and choreography, delivering the top hits of this legendary 1950's US rock 'n' roll/pop group. The ultimate tribute act!! This fantastic tribute show features 4 male vocalists (taking the roles of the original Four Seasons - Frankie, Tommy, Nick & Bob), with specially commissioned and recorded backing tracks. Their repertoire features the group's massive hits including Sherry, Big Girls Don't Cry and Can't Take My Eyes Off You, to name but a few and they execute each number with accompanying smooth, slick dance moves. If you're a fan of The Four Seasons, you're guaranteed to enjoy yourself at this show and who knows you may even find yourself taking part, singing and dancing along!! 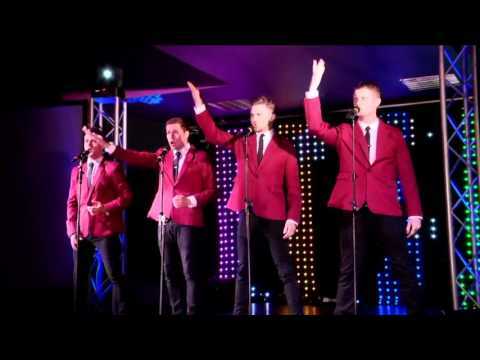 It's a brilliant live show; inspired by the boys' time in the widely successful West End stage production "The Jersey Boys - The Life Story Of Frankie Valli & The Four Seasons". Each individual's talent & charisma is clear, as is their collective love & respect for the legacy that this rock 'n' roll group created. This Midlands based tribute act is a superb choice for corporate entertainment - why not check out their promotional video tab? Or if you're interested in finding out more, you can check their availability and get an instant direct price quote by adding The Essential Jersey Boys to your shortlist of favourites or by clicking check availability and price. The essential jersey boys were fantastic; all of our guests loved them and they interacted with everyone brilliantly. Best choice we made for our evening music. The boys were Absolutely Bloody Marvellous. All of the guests (60+) thought they were amazing and as a result we are "the talk of the town". It will be hard to beat the performance that they gave, along with the crowd participation, Elton John or Robbie Williams couldn't have done better. All in all, well worth the money and I would whole heartedly recommend them to anyone of any age group. The Essential Jersey Boys were excellent and really made our Christmas Party this year. The feedback from clients and staff was nothing other than positive. Send out big thanks to the band. Excellent throughout. Flexible, helpful, charming, generous with their time and a brilliant performance which had a disparate age range all up dancing. Great feedback from guests. Excellent performance enjoyed by all. Would definitely book again. The Essential Jersey Boys are highly professional, did an amazing performance and made our wedding celebration 'Oh what a night!' Everybody loved them and they were perfect for the venue and the guest age range.